There are many models of the commissioning cycle but all share some common features and all include, in some form or another, a stage where the needs of the population you serve are assessed. 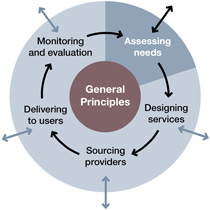 Assessing needs may form part of a higher-level process called ‘analyse’ or ‘strategic planning’ (for example, in the NHS commissioning cycle). There are other elements that can be covered in this ‘arc’ of the commissioning cycle, such as analysing the gap between needs and existing service provision, and identifying and agreeing local priorities. Assessing needs is a crucial step in the commissioning process. If your understanding of people’s needs is poor then your design and delivery of services is unlikely to meet their needs and achieve the outcomes required. This represents poor value for money. A good understanding of the current and likely future needs of your local population is crucial if a suitable strategy to meet those needs is to be produced and put into practice economically, efficiently and effectively. However, assessing the needs of your population may be difficult: their needs may be many and varied; some people and their needs may not be apparent to you; some people may not be able to express or communicate their needs; or your understanding of their needs may be based on mistaken assumptions. Engaging with stakeholders, especially service users, will be necessary but this too can be difficult and costly (in time and/or money). Engaging with third sector organisations (TSOs) (among others) can help you overcome these difficulties. TSOs can be important intermediaries and, besides helping you assess needs, may also be able to help you identify how you might best meet those needs. See Engaging with TSOs for further guidance. You need to have sufficient and appropriate authority vested in or delegated to you. This link leads to further guidance. Do I really know how TSOs could help me? Are TSOs aware of me and my role in commissioning services? Do I have the legal power or duty to commission the services I envisage? Is there money available to fund these services? Is it the right kind of money? Do I have the authority to decide? Note: Section 116 of the Local Government and Public Involvement in Health Act 2007.